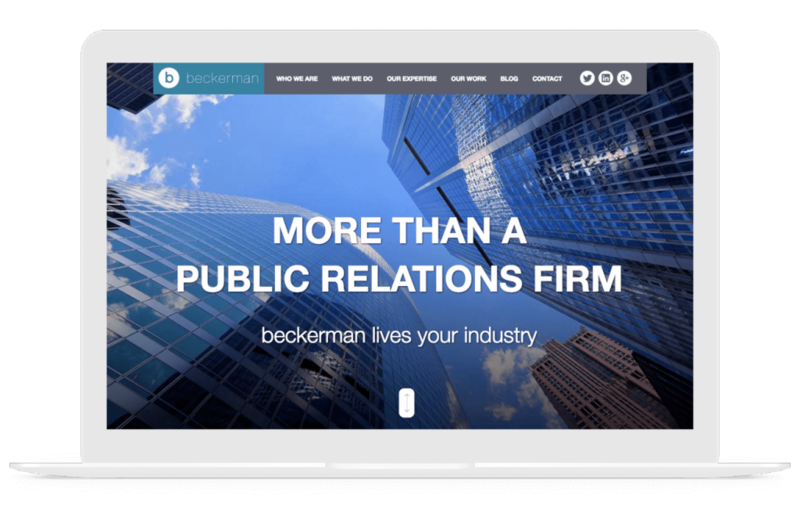 Beckerman is one of the fastest-growing and largest independent public relations firms in the industry. Antenna Group is a division of Beckerman and is currently the largest, most experienced PR agency in the renewable energy sector. 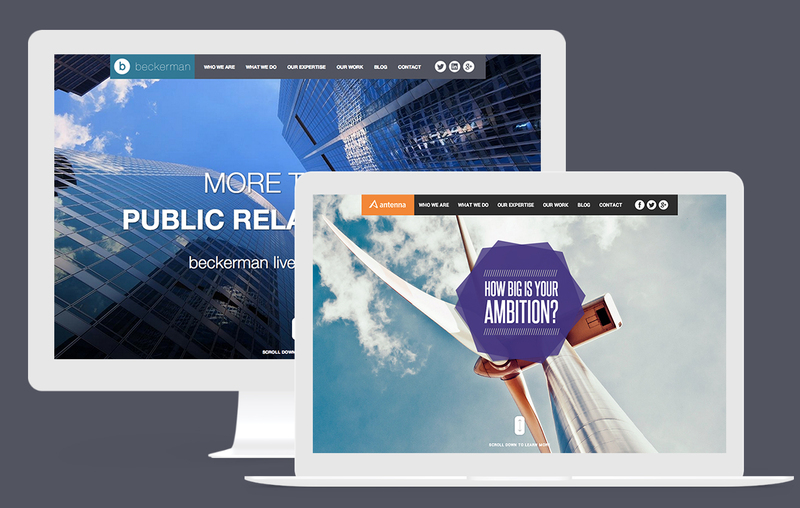 Beckerman approached Gravitate to design, build, and optimize two sites to represent both companies. Each site should be distinct and representative of the individual brands while sharing aesthetic consistencies to facilitate users’ understanding each company falls under the same corporate umbrella. Our designers and content strategists dug into this project and produced highly detailed wireframes and content architecture. It was crucial to mock up and map out all content within both sites to ensure consistent navigation and optimal usability. After several rounds of internal revisions and some constructive client feedback, we finalized our blueprint for developing and optimizing both websites. We worked with representatives from both Beckerman and Antenna Group to establish unique, yet still connected moodboards (not specific design elements but rather visual indicators of the site’s tone and feel). 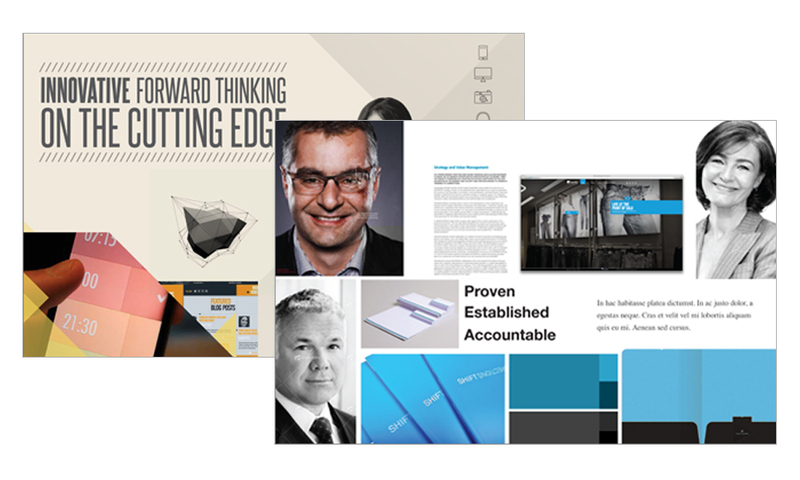 The chosen moodboards, shown here, directly influence design and content decisions made throughout each company’s website and print collateral materials. Our goal was a bold departure from the previous Beckerman identity. Working with geometric shapes and modern typefaces created an overall simplicity that gives the logo an inherent sense of confidence. In the end, we crafted a logo that pays homage to the traditions of the company while capturing Beckerman’s forward thinking mentality. To resonate with younger audiences and the rapidly expanding renewable energy industry, an identity was needed to communicate a sense of spirit and vitality. Sharp geometric shapes are used to create depth and movement, resulting in a blended identity system that both stands alone and in perfect balance within the corporate umbrella. 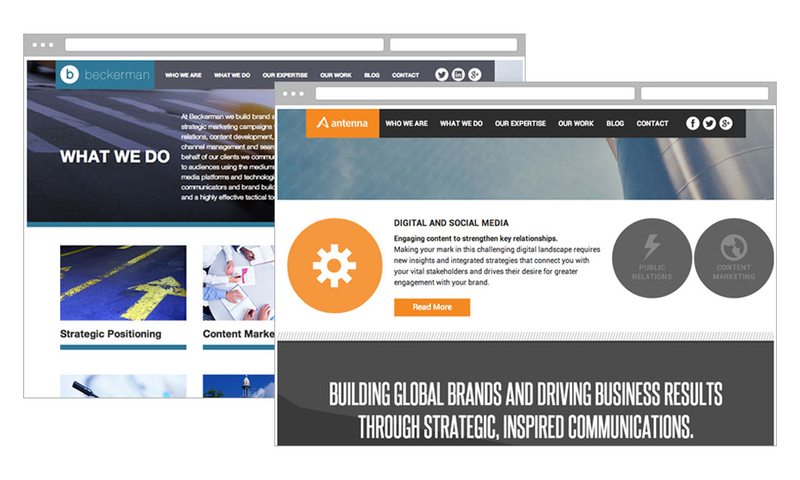 Both Beckerman and Antenna Group have unique audiences, messaging, and imagery to reach their target markets. The client stressed it was critical that each website speak directly to its target audience while remaining recognizable as satellite divisions of a larger corporation. The challenge for us was to design and build a website that communicated Beckerman’s core values, track record, and range of services—and then re-skin the entire design, swap the messaging for Antenna Group, and yet remain intuitive and easy to use. Both the client and the staff at Gravitate were incredibly pleased with the results of this project. We met accelerated deadlines, exceeded the client’s requests, and built two connected websites and identities that speak to disparate audiences and that have no problem standing on their own.